This tutorial will walk you through the basics of using the Deep Learning Deployment Toolkit's Inference Engine (included in the Intel® Computer Vision SDK). This tutorial will walk you through the basics of using the Deep Learning Deployment Toolkit's Inference Engine (included in the Intel® Computer Vision SDK). Here, inference is the process of using a trained neural network to infer meaning from data (e.g., images). In the code sample that follows, a video (frame by frame) is fed to the Inference Engine (our trained neural network) which then outputs a result (classification of an image). Inference can be done using various neural network architectures (AlexNet*, GoogleNet*, etc.). This example uses a Single Shot MultiBox Detector (SSD) on GoogleNet model. For an example of how SSD is used see this article on the Intel® Developer Zone. The Inference Engine requires that the model be converted to IR (Intermediate Representation) files. This tutorial will walk you through the basics taking an existing model (GoogleNet) and converting it to IR (Intermediate Representation) files using the Model Optimizer. So what's different about running a neural network on the Inference Engine versus an out of the box framework? Inference can run on hardware other than the CPU such as the built-in Intel® GPU or Intel® FPGA accelerator card. 5th or greater Generation Intel® Core™ processor. You can find the product name in Linux* by running the ‘lscpu’ command. The ‘Model name:’ contains the information about the processor. Note: The generation number is embedded into the product name, right after the ‘i3’, ‘i5’, or ‘i7’. For example, the Intel® Core™ i5-5200U processor and the Intel® Core™ i5-5675R processor are both 5th generation, and the Intel® Core™ i5-6600K processor and the Intel® Core™ i5 6360U processor are both 6th generation. No discrete graphics card installed (required by the OpenCL™ platform). If you have one, make sure to disable it in BIOS before going through this installation process. In order to run inference on the GPU, you need to first install the OpenCL™ Runtime package. These commands install the OpenCL™ Runtime package, as well as some package dependencies required by the Intel® CV SDK. Note: These steps are for Ubuntu 16.04.3 or later. If you have a version older than 16.04.3, then you need to still install the Package dependencies below, then skip down to the Install Intel® CV SDK section for instructions on installing the OpenCL™ Driver. Register, then wait for a confirmation email. It can take several hours to get the email. So go take a break and come back once you're received the email. 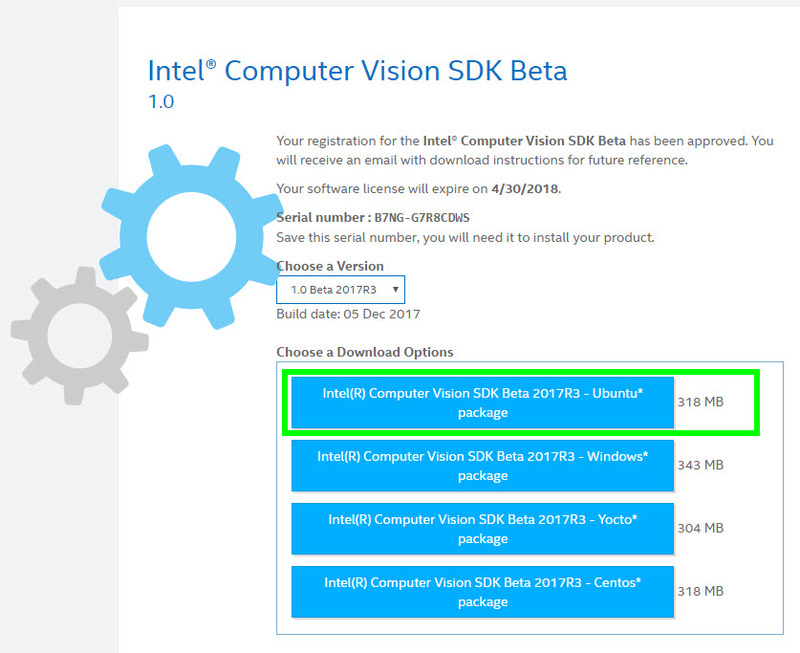 If you've already registered for the Intel® CV SDK before, you should get access to download almost immediately. Note: If you are running a version older than Ubuntu 16.04.3, then to install the OpenCL™ Driver you need to run the install_OCL_driver.sh script in the downloaded folder before running the Intel® CV SDK installation. This script can take over half an hour to complete. It will re-build the kernel with the updated driver. Your computer will restart through the process. Make sure to backup your data before running this script. If you prefer not to continue with this kernel re-build, then we recommend you install Ubuntu 16.04.3 or later which only needs a few files installed (instructions above) and does not need a kernel re-build. Note: Make sure to exit super user mode before cloning this repository. Caffe is required to convert a Caffe model using the Model Optimizer. This script will install a version of Caffe to the opt/intel/ssdcaffe folder that is compatible with the Model Optimizer. This should take somewhere between 10 and 20 minutes depending on your system. The Caffe model consists of two files: SSD_GoogleNetV2_Deploy.prototxt and SSD_GoogleNetV2_Deploy.caffemodel. You will convert them to IR files by running the Model Optimizer using the runMO.py script. Look in the /artifacts/VGG_VOC0712_SSD_300x300_deploy folder. You should see a video play with people walking across and red bouding boxes around them. You should also see the output in the console showing the objects found and the confidence level. -m <path>    Required. Path to IR .xml file. -l <path>    Required. Path to labels file. In this sample video, there are approximately 790 frames, so by setting the number of frames to 790 you'll see the whole video. If you change the threshold of the confidence level to 0.1, you'll see a lot more bounding boxes around the people, but also many false ones. You can enable the output of performance data to the console by using the -pc flag. You'll see the Total time it took to run. Since you installed the OpenCL™ drivers to use the GPU, you can try running inference on the GPU and compare the difference. The Total time between CPU and GPU will vary on your system. How does the Inference Engine work? The Inference Engine takes a representation of a neural network model and optimizes it to take advantage of advanced Intel® instruction sets in the CPU, and also makes it compatible with the other hardware accelerators (GPU and FPGA). To do this, the model files (e.g., .caffemodel, .prototxt) are given to the Model Optimizer which then processes the files and outputs two new files: a .bin and .xml. These two files are used instead of the original model files when you run your application. In this example, the .bin and .xml files are provided. In the above diagram, IR stands for Intermediate Representation, which is just a name for the .xml and .bin files that are inputs to the Inference Engine. It also converts it to a planar format (by default it is in packed format). Packed format is arranged like RGBRGBRGB, planar is arranged like RRRGGGBBB. This is done by using the InferenceEnginePluginPtr _plugin() function. Note: The .xml file contains the network, and the .bin file contains the weights. Refer to the code for how to setup the input and blobs. Note: The image size is resized based on the expected size in the model .xml file for every fram before inference is ran. The article mentions Linux, and all steps are explained for Linux users. Our software requires Windows. Is there an SDK for Windows available?